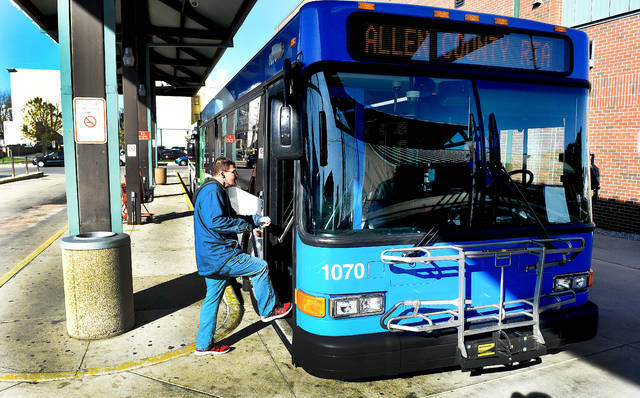 LIMA — The Allen County Regional Transit Authority has officially decided to put another levy on the spring ballot requesting a .1 percent sales increase. While the ACRTA had failed the first time to convince voters when it asked for a .25 percent sales tax increase in 2017, the organization has since limited the levy’s scope and dropped the levy request from a one-quarter percent increase to a one-tenth percent sales tax increase over a ten-year period — the lowest amount that can be requested. If approved, the levy would add $1.2 million annually to the ACRTA’s operating budget, thereby allowing the transit authority to expand its level of service to what it was prior to cuts made at the beginning of 2018, when both nights and weekend routes were canceled. Due to those cuts, ACRTA Executive Director Sheila Haney estimates 2018 will end with a total of 230,000 riders for the year compared to the 400,000 riders recorded in 2017. That reduction has a significant impact on the organization’s typical operating budget as federal funds are allocated to transit authorities depending on ridership numbers. Without reversing the trend, Haney estimates that both ACRTA’s ridership and funds will continue to decrease until it could not offer its services. In theory, the new levy would bring the group’s operations back up to par. Since failing at the ballot a year ago, ACRTA has worked to change community relations — rallying its marketing efforts, upgrading its social media and forming partnerships with manufacturers to provide services to their employees. ACRTA’s latest move has been hiring a consulting firm out of Kansas City, ClearVision Consulting, to create a business plan and convince the business community of ACRTA’s role in local economy. The first draft of the document was passed out to the board during its November meeting Tuesday. “I thought it was a very good way to present the information when they ask,” Haney said. Haney said such materials can better spell out how funds are utilized throughout ACRTA, and it shows just how levy dollars would be used if voters agreed to the sales tax increase. Haney admitted to the board that the ACRTA’s first levy campaign did not justify the need for the increase to the voting public when they asked questions, and this time around, the transit authority is looking to be as upfront as possible about where the dollars will be headed. Last month, the board had agreed to a spring levy but had yet to finalize the amount the ACRTA wanted to pursue. With information coming back from ClearVision, the board agreed with the consultant’s findings of a necessary .1 percent increase. “I feel like the consensus in this room was a tenth, and it was confirmed with the data by this business plan,” Board President Brad Taylor said.